Plants are frail and sensitive living organisms. It can often prove to be quite difficult for them to catch roots or bloom. They often grow in specific conditions to which they are natives off. To emulate the desired climate in an artificial setting, grow lights are used. Lights like the Dimgogo 1000W help to properly look after the plant in order for them to grow healthy. There are countless LED grow lights to pick from. These lights take care of your precious cannabis; among the many is the Dimgogo 1000w LED grow light. False advertisement is a common problem in every industry. That is why we have tested a Dimgogo LED ourselves, to assess all of its features and list its pros and cons. 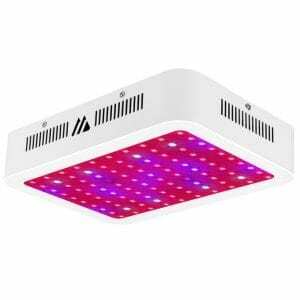 The Dimgogo 1000W LED grow light is an ideal grow light for horticulture. 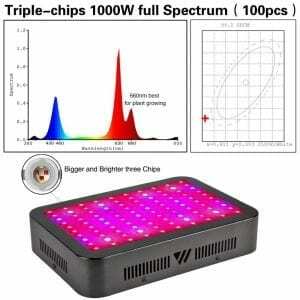 It has triple chip technology that provides a full spectrum of light. This full spectrum consists of UV, red, IR, blue, and white light that mimics sunlight. This provides the optimal conditions for all indoor plants vegetation and flowering growth stages. It also has a 120-degree lens that helps in the intensification and magnification of the light without any additional power being used. 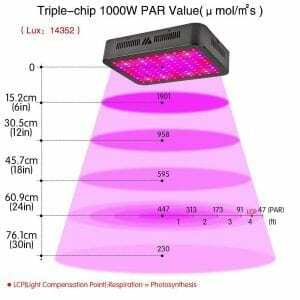 However, if you are used to using a single chip LED grow light, you will have to take care of how you hang the light. This way, you can get the optimal results, as there might be some sort of imbalance. It has a coverage area of 5.1′ x 4.7′ and should be hung at around 24″. 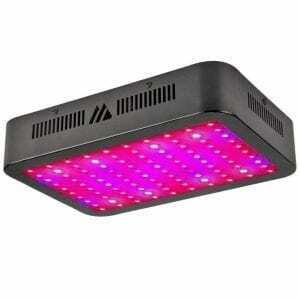 This 1000 watt led grow lights embrace red, white, blue, UV and IR that is alike sunlight. It is therefore perfect for all types of indoor plants at all growth phases. Dimgogo states that it is a 1000W light, however, they are theoretical watts. Which means that it might not be a 100% true representation of the lamp’s performance. The light is also very power efficient and reduces overheads as it consumes only 185W of light. The Dimgogo 1000W can be placed between beginner and industrial level, making it ideal for various projects. The metal used in the frame is lightweight, thus ideal for hanging. The company has a great customer service, a 3-year warranty and 30-day money back guarantee if the customer is not satisfied. 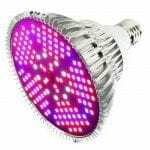 It has 2 pre-installed fans and a heat sink installed in each fixture of LED grow light that cools of the system and grow tent. This reduces the chance of overheating the plants or the lights and it increases the life span. The materials used in this light are not top quality. 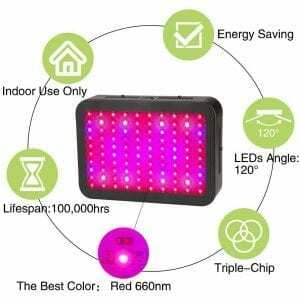 It is a good light for beginning growers who are looking for a LED grow light. The Dimgogo 1000W review can be summed up by: it does the job without all the expensive functions and is good for every small grow room. The best results are achieved when you keep the light in an open tent or at room temperature. Humid or warm conditions can damage the light. Do you want to see a Dimgogo 1000W live in action? Check out this video below! 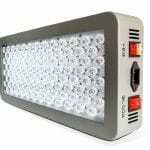 Simply put, the Dimgogo 1000W LED grow light is best suited for beginners. This is not a great option for experienced users or big projects as it will not be able to keep up. We also missed the option to daisy chain this light. 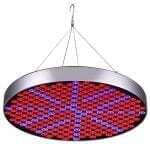 It is not something you find often in this price range, but some of the competing lights do have this. That being said one cannot deny that the light produced by Dimgogo 1000w is good. It definitely helps plants go through their vegetative, flowering, and blooming stage. It optimizes their growing stages. The setup and use of the Dimgogo LED is very easy. Read our complete guide on how to buy the best LED grow light. Do you want to start your own indoor growing system? Read about the best systems for hydroponic indoor growing. Looking for a similar in the same price range? Read our review on the Roleadro GalaxyHydro 1000W.